Ted Baker is renowned for its sophisticated and eternally stylish approach to one-of-a-kind, fashion-forward jewellery and these versatile and chic, the earrings can be work as drops or studs to suit the occasion. 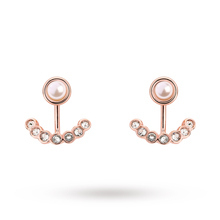 They feature Pearls and faceted round-cut crystals that will reflect light beautifully as you move. Complete with butterfly fittings that are for pierced ears only.